This year my kitchen has been running in a little bit of a different way. Partly because we've been focusing on the household budget, something that has curtailed my game, boutique grain and exotic heirloom vegetable habit, and partly because I am devoting a good deal of my daily energy to the nurturing of my son's self-sufficiency while he steps out of the cocoon of his babyhood. He is walking now. Can you believe that? He astounds me with his capacity to learn and his sense of humor. When you have to manage your time and thoughts around a bundle of energy and love for the world that has, in the blink of an eye, developed a will of his own, you must prioritize differently. This has manifested in our kitchen with a lot of what you might call mama's cooking. 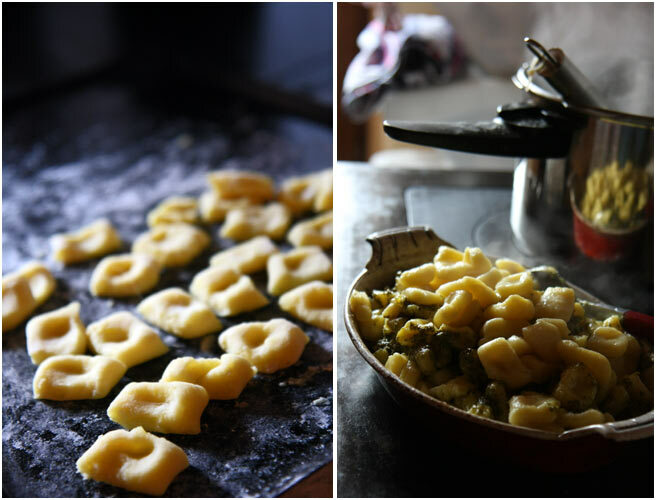 I have begun to rely on the simple dishes, and Gnocchi falls in that category. This goes very nicely with any ragout or winter stew, in soups, or with a dollop of that delicious nettle pesto that was put up last spring. Try your gnocchi in oxtail soup if you find the meat on sale. The baby can eat them one by one, and husbands appreciate them too. I don't buy gnocchi anymore because they are so cheap to make. Homemade tastes better anyway. This is originally a Judy Witts Francini recipe, from her book, with my notes from the margin. One of the great things about this gnocchi is that you can prepare this in advance and refrigerate it. You can have it ready to plunge into a pot of boiling salted water when it's time for dinner. Once you've prepared it a couple of times you will know by feel if you have enough flour. *about the potatoes: if you care enough to get the right kind of potato, this can make a world of difference in your gnocchi. Make sure you get the most flavorful, floury kind you can. *about the flour: We all know it varies from country to country. I have been preparing this with French flour type 65 which can be rather soft in comparison to many flours, requiring me to up the flour ratio a bit. Experiment, do the drop test, and find a good ratio for the flour you use at home. Don't feel like you have to go out and buy any special flour. - Boil unpeeled potatoes in salted water until tender and remove the skins once cooked. Rice or mash them. Let them cool slightly and add the rest of the ingredients, stir. When stirring becomes difficult, knead the dough lightly by hand. - Bring the salted water to a boil and lower the heat to a simmer. Take a pinch of the gnocchi and do a drop test, it should sink to the bottom initially, then rise to the top when done. If the gnocchi is disintegrating, add more flour to the dough. - On a lightly floured board, roll out into cigar-like ropes, no thicker than a finger. Cut into pieces and roll on fork prongs to form ridges and poke your finger lightly into one side to form an impression. - Poach the gnocchi and remove from the simmering water after 20-30 seconds with a slotted spoon into the serving dish. From this point you can layer it with your favorite sauce, or save it for reheating later. Beautiful post, beautiful boy. And people say the baby learns so much in the first year, well, the mama learns a lot as well. Homemade gnocchi is by far one of the most loving endeavors one can make in the kitchen for their family. So comforting and satisfying. very good! and the children il wonderfull!! Mmmm, mama's cooking, indeed. Such a different rhythm and tempo, though so very rewarding in ways unimagined. I've never thought of gnocchi under this header, but may need to re-consider. I've never made gnocchi from scratch and have been wanting to for some time now. Now I will have to, this looks so good! I love those finger-dimpled dumplings. What a wonderful, cozy, mama-made meal - such a lucky family! Beautiful food and a lovely little boy. Thank you for sharing.. I have a wonderful memory as a child of sharing the lunch of an Italian family and taste their homemade gnoccis. Succulent! Time to do mine.. Thank you !